Since this is a preview portal, we cannot make conclusions about their offering at this point of time. The portal shows different plans, devices and services which Rliance Jio plans to offer across India through its 4G network. Mifi Data with 1 GB data along with Digital services. Start-up Plan worth Rs.100 will offer 1 GB data along with Digital services. Mifi,Wifi and Digital Services along with 10 GB of Data. Start-up Plan worth Rs.500 will offer 10 GB data along with Digital services. 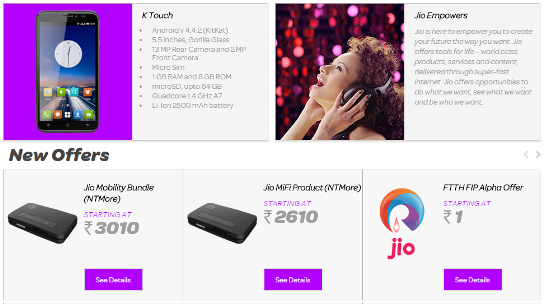 The above details are taken from Reliance Jio’s preview portal hence we are not sure about the final tariff plans. We may expect some cheap data offerings from Reliance Jio for sure, at least as a promotional offer for a couple of months.